IN a bid to raise awareness on people’s rights under the law, Taylor’s Law School organised the Law Awareness Week in collaboration with the Malaysian Bar last month. The event, themed “Taking Rights Serious-ly”, was aimed at helping people with no legal background to know their rights and understand the laws that affect them. The event was also aimed at encouraging the public to come forward and air their concerns on legal matters that they were facing, especially those living in the surrounding communities who did not have the funds to engage lawyers. The event kicked off with a public forum featuring Malaysian Bar vice-president Christopher Leong, Universiti Teknologi Mara (UiTM) senior professor of law and legal adviser Prof Emeritus Datuk Dr Shad Saleem Faruqi and Association of Women Lawyers secretary Goh Siu Lin. Leong officiated at the ceremony. 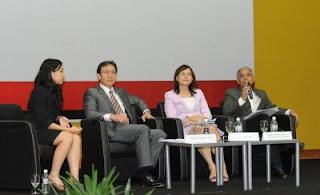 Distinguished speakers: (From left): Taylor’s University law lecturer Justina Chen, Leong, Goh and Dr Shad Saleem. Dr Shad Saleem spoke on “The Right to Counsel in Malaysia” while Leong spoke on “The Right to a Fair Trial”. Goh’s speech on “Women’s Rights” received wide applause from the students. Also present were Taylor’s University (Taylor’s) vice-chancellor and president Prof Datuk Dr Hassan Said, Taylor’s Law School dean Harmahinder Singh as well as lecturers and students of the school. “The students are able to put into practice what they have learnt in the classroom and at the same time learn about responsibility through community service and outreach,” said Prof Hassan. The event also raised awareness on the institution’s Legal Aid Centre, which provides pro-bono legal advice to the public. Besides providing free legal advice to clients, it also contributes to students’ clinical legal education. The Legal Aid Centre, which has been operating since March, is open to the public every Wednesday and Friday, and students take turns to be on duty with a lecturer to guide them on the cases that come in. The centre has handled over 20 cases so far, mostly related to tenancy and landlord agreements, family law, employment matters and many more. Law student Lena Chua said, “Even though I have not had a chance to handle a case, I am confident that this is where I belong. This is what I want to do. Studying law helps me to know my rights and also helps me to educate the public on their rights”. Student Jack Lee said the experience gained was invaluable. “Having to deal with cases at the centre will help us improve our communication skills and handle clients in the future,” he said. An international student from Sudan, Habiba Mukhtar Abubaker said the event enabled her to meet people from the legal fraternity. “I got to hear their thoughts on issues concerning human rights which has provided me an insight to the issues involving indigenous people,” she said.